Ejot’s new range of heavy-duty fixings ... comprehensive. Ejot, a leading global building fastener manufacturer with over 30 years of experience and development know-how, recently launched its latest innovations for heavy-duty fixings, which include chemical anchors, anchor bolts and self-drilling fasteners. The chemical fasteners, which can be used for all construction-related anchoring needs, were developed at Ejot’s laboratories in Bad Laasphe, Germany. They can be used for standard anchoring applications with threaded rod and rebar, according to Fatih Delen, business development manager for the Sharjah-based Ejot Middle East. Ejot chemical anchors were officially unveiled in the Middle East at the beginning of this year. “The new Ejot chemical fasteners line provides superior adhesive solutions for anchoring heavy, structural and light loads,” says Delen. 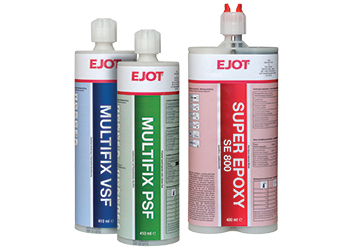 “The Ejot SE 800, Ejot Multifix VSF and Ejot Multifix PSF have been certified according to ETA European Standards, which guarantees the quality and high-level performance of the Ejot chemical anchors. He says Ejot SE 800 (pure epoxy) and Ejot Multifix VSF (vinylester, styrene free) have been designed for threaded rod and rebar applications for concrete. They can also be used in submerged holes. Meanwhile, the Ejot Multifix PSF (polyester, styrene free) has been designed for masonry blocks for threaded rod applications. Ejot chemical anchors range comes in a rigid cartridge which reduces waste, and with two mixer nozzles attached. Accessories are available to support the product range, such as threaded rod, sleeves (for hollow blocks), applicator gun, cleaning brush, and blow-out pump. Ejot also has a calculation programme for the design and selection of chemical anchors, says Delen. To be made available by the end of this summer, the programme has simple graphics and the data input area is clear and easy to use, according to Delen. “It allows for concrete thickness, spacing and edge distance, and loads in all directions. Currently, Ejot sales engineers can provide assistance for the design and selection of chemical anchors as well as consumption calculations,” he adds. Alongside the chemical anchor range, Ejot offers anchor bolts, designed to be used on both cracked and non-cracked concrete. The BA-V (galvanised), BA-E (stainless steel A4), and BA-F (hot-dip galvanised) anchor bolts have been certified according to ETA European Standards (Option One), which guarantees their quality and high-level performance. Ejot has also expanded the JT3 Bi-metal stainless steel self-drilling fasteners range with the addition of an 18-mm drilling capacity fastener. “The new self-drilling (JT3-18-5,5 by 55) fastener provides a perfect solution for users when they are fastening thick materials such as profiled steel and aluminium sheet and sandwich panels to 4-16 mm steel substructure, or profiled aluminium sheet and sandwich panels to 4-18 mm aluminium substructure. Users no longer need to pre-drill for these applications; they can tap and fasten at the same time. The new self-drilling fastener can greatly improve users’ production efficiency and quality of the installation,” Delen elaborates. The JT3 is being produced as A2 stainless steel with hardened drill point, and it can be ordered with or without a pre-assembled stainless steel sealing washer. A further addition to the company’s portfolio is the Ejot high-performance butyl sealant tape, which is a Grade A poly-isobutylene-based sealant tape, which is said to meet and exceed all sealing requirements for steel and aluminium roofing and cladding systems. Ejot products have been used in key projects in the region including King Abdulaziz International Airport in Jeddah, Saudi Arabia, the Midfield Terminal in Abu Dhabi, UAE, and the Hamad International Airport in Doha, Qatar.